A peculiar criminal defense is making its way around the internet, and while the insanity plea is nothing new, the specifics of this unique case are virtually unheard of. Last month a Texas teen was allegedly stabbed in the abdomen by his long-time friend, a 15-year-old whom he attended high school with. The near fatal wound caused intestinal lacerations, leaving the victim to recover in the intensive care unit of his local hospital for three days. 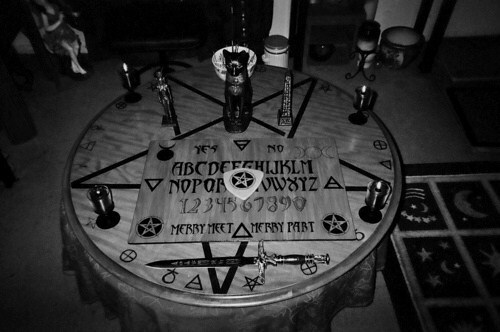 Police were shocked to find out the details of the attack, one factor in particular that included a Ouija Board. The ever-so-popular board game has made its way into American pop-culture throughout the years, and is primarily used in the same manner as ghost stories around campfires; to create an atmosphere of fear. Although no one can seem to pinpoint who created the now Hasbro-owned novelty, one thing is certain — the Ouija board has been the subject of voodoo, devil worship and paranormal phenomena for the entirety of its existence… but murder? This may sound like a bad story line straight out of a lifetime movie, but in fact it has already been used in a number of Hollywood blockbusters. In the 1944 film The Uninvited, Ouija made its movie debut, captivating audiences around the country and leaving them in question about the mysterious board game. For notable horror movies such as Witchboard, Paranormal Activity and The Exorcist, Ouija proves to be essential to the plot, usually foreshadowing the terror that lies ahead. But for the above mentioned 14-year-old teen out of Weslaco, Texas, the horror surrounding the séance inducing board game was all too real. The victim was spending his day as any boy would like to: The 14-year-old was assumingly amongst friends while hanging out in awooded area behind the high school he attended. The scene turned from buddy to bloody as his 15-year-old friend allegedly attempted to kill him, stabbing him with a four-inch knife. The news was reported first by KRGV last Friday — watch the video here. Athird party was reportedly present at the time of the incident, and revealed that immediately after the alleged stabbing, the attacker pleaded with the victim to say that he had fallen on the knife. Moments later the victim was taken to a nearby auto shop where help was called. An attorney for the 15-year-old hopes to build a case around insanity, a plea that only has a 26 percent success rate. His client is currently being held at the Hidalgo County juvenile detention center in Edinburg, Texas.